(a) Using a knife, cut away any rough areas on the body. HINT: Leave as much adhesive on the body as possible. (b) Clean the cutting surface of the adhesive with a piece of shop rag dampen with cleanser. (a) Remove the damaged stoppers and dams. (b) Using a scraper, remove the adhesive sticking to the glass. (c) Clean the glass with cleanser. Install new stoppers onto the glass. Install new dams with adhesive tape as shown in the illustration. NOTICE: Do not touch the glass surface after cleaning it. (a) Place the glass in the correct position. (b) Check that all contacting parts of the glass rim are perfectly even. (c) Place reference marks between the glass and the body. Using cleanser, clean the contact surface which is black-colored area around the entire glass rim. 7. COAT CONTACT SURFACE OF BODY WITH PRIMER "M"
Using a brush, apply Primer M to the exposed part of the body on the vehicle side. Let the primer coating dry for more than 3 minutes. Do not coat Primer M to the adhesive. Do not keep remaining Primer M for later use. 8. 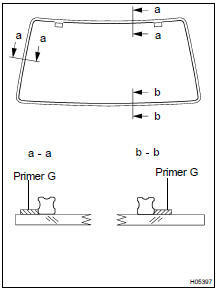 COAT CONTACT SURFACE OF GLASS WITH PRIMER "G"
(a) Using a brush or sponge, coat the edge of the glass and the contact surface with Primer G.
(b) If the primer is coated wrongly to the area not specified by accident, wipe it off with a clean shop rag before the primer dries. Do not keep remaining Primer G for later use. (a) Cut off the tip of the cartridge nozzle. HINT: After cutting off the tip, finish up all adhesive within the time described in the table below. (b) Load the cartridge into the sealer gun. (c) Coat the glass with adhesive as shown. (a) Position the glass so that the reference marks are lined up, and press in gently along the rim. (b) Using a spatula, apply adhesive on the glass rim. (c) Use a scraper to remove any excess or protruding adhesive. 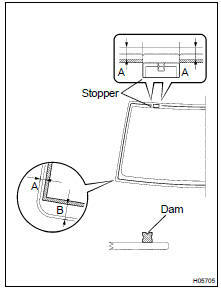 HINT: Make sure the dam is attached to the body panel, as shown in the illustration. (d) Hold the windshield glass in place securely with a protective tape or equivalent until the adhesive hardens. NOTICE: Take care not to drive the vehicle within the time described in the table below. (a) Conduct a leak test after the adhesive dried completely. (b) Seal any leak with sealant. Part No. 08833-00030 or equivalent. Apply adhesive to the moulding installation area between the glass and the body. Place a new moulding onto the body and tap it by hand. (a) Using an air riveter with nose piece No. 4, install 4 new rivets and the outside No. 2 moulding. HINT: Before using the air riveter with nose piece No. 4, cut 5 mm (0.20 in.) from the edge of nose piece No. 4 as shown in the illustration. Do not prize a riveter. It could damage the riveter and cause loose fitting and mandrel bend. Do not tilt the riveter when fasten the rivet to the material to avoid loose fitting. Do not allow gap spacing between the rivet head and the material. Do not allow gap spacing between the materials. (a) Install the cowl top ventilator louver LH. (b) Install the cowl top ventilator louver RH. (a) Operate the wiper motor once and turn the wiper switch OFF. (b) Install the wiper arms and tighten the nuts by hand. 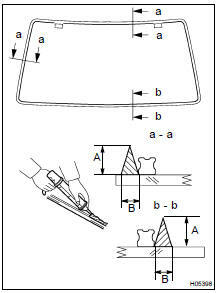 (c) Adjust the installation positions of the wiper arms to the positions as shown in the illustration. (e) Install the 2 wiper arm head caps. (a) Install the inner rear view mirror with the 2 screws. Connect the connector, then install the overhead console box with the bolt. Install the holders with the screws. Install the double visors with the screws. (a) Install the sun visors with the screws, then connect the connectors. (a) Install the front assist grip with the 2 screws, then install the 2 assist grip plugs.